21/21 Jason Lee It's not bad, but it's not very good either. 24/98 David Mumpower I am shocked by how much I enjoyed this movie. It's got the spirit of Romancing the Stone even if it lacks the same story or acting talent. 37/196 Max Braden This isn't an unenjoyable way to spend an evening: beautiful environs, hot bods, and treasure. Oh, the genre of the chick-flick. It’s the scourge of the all-American movie-going man: To suffer through 90 minutes of touchy-feely emotions and lame jokes when he could be watching the latest action-packed blood-fest just two theaters down is tragic. Since there will always be a demand from women to see something other than explosions, there will be work for men like director Andy Tennant. 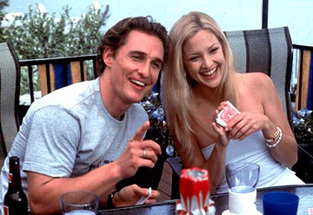 In Fool’s Gold, Kate Hudson and Matthew McConaughey are together again (their other project was How to Lose a Guy in 10 Days, a product of the aforementioned genre), this time as a couple of treasure hunters whose marriage breaks down after a long, unsuccessful hunt for booty (sounds like the last few months of my life). However, their relationship (and the weak plotline) gets a shot in the arm after they happen upon evidence that may lead them to the fortune they’ve been seeking their whole lives. Lame jokes will almost certainly ensue. Though Andy Tennant did not bring us How to Lose a Guy in 10 Days, he did find profitability in this genre with Sweet Home Alabama, which took in $138 million, and most recently the Will Smith smash Hitch which took us for $177 million. To anyone who thinks that Hitch was not a chick-flick, I dare you to level the number of relationship jokes to the number of explosions and just try to stand by your assumption. See the latest developments for this project on the Fool's Gold Movie News page.